Well if you haven’t guessed already…ALOHA and welcome to Hawaiian week on Sodium Girl. The spring weather is beginning to creep in and with a few sunny days under my belt, I am itching to get to the beach and soak up some fresh air, and perhaps a few tropical drinks. To celebrate the longer days of sunshine and lazy weekends ahead, I thought I’d hop off the mainland for a bit and try out some low sodium versions of island classics. Before we launch into spare ribs and papaya coleslaw, a bit of background first. Hawaiian food tends to be high in sodium. Because of its Asian influences, soy sauce and Teriyaki run deep in its most famed recipes. Thanks to the more Americanized contributions, Spam also tends to have a starring role. Clearly, as a low sodium cook, you can substitute the soy sauce and Teriyaki sauces with some low sodium substitutes, which as I have stated before, do not taste identical on their own but work very well when incorporated into a larger recipe. You can also substitute fresh pork for the spam. Again, the taste won’t be the same, but you can approximate the same fatty, juicy flavors. But for my Hawaiian experiments, I decided to not use soy sauce or Teriyaki substitutes. 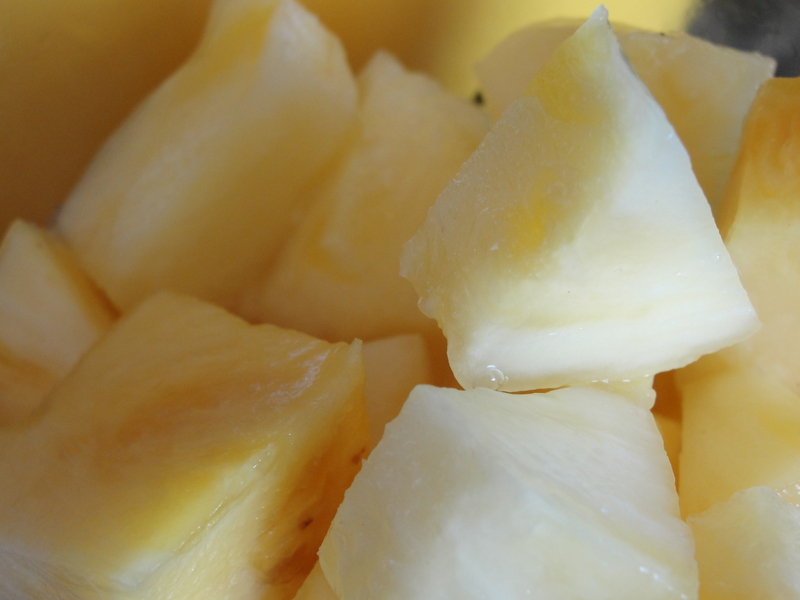 Instead, I focused on the natural sweet and spice of traditional ingredients that makes Hawaiian cooking so special. Pineapple, papaya, honey, ginger, peppers, and of course, lots of fresh fish and pork – with these components, it is easy to coax out and highlight natural flavors and create something that tastes great. No prepared products necessary. 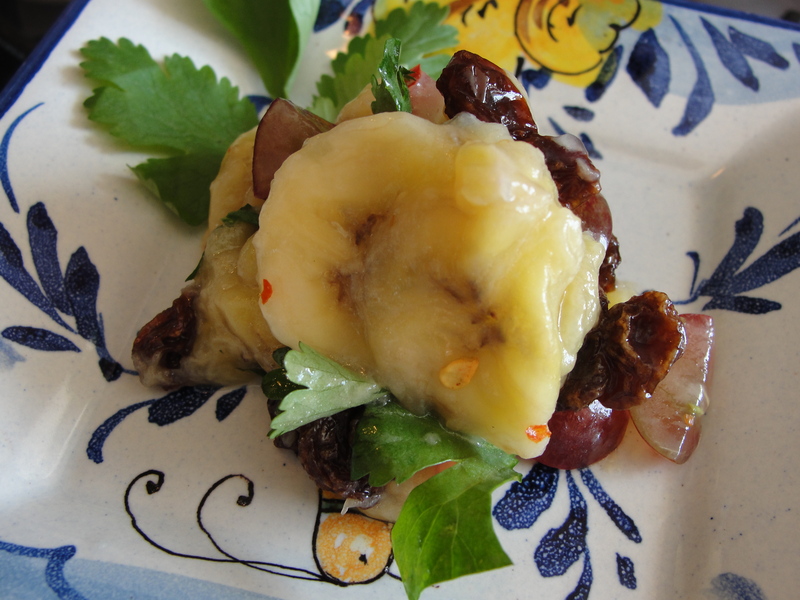 So for today, we’ll start with something simple, but unexpected: Thai Banana Salsa. I often find myself wondering, what can I put on fish that would make it more interesting than say, onions, herbs, tomatoes, and mushrooms? And this salsa is a wonderful solution and a fun “sauce” to have in your cooking repertoire. Plus, the natural caramel flavors of the banana, the spice of the jalapeno, and the cool sweetness of the grapes have enough punch that the dish does not need even a pinch of salt. Try this topping with some halibut, Mahi-Mahi, or even a more delicate rock cod. And remember, this is just the start to a long week of coconut milk, roasted pork, and other fun recipes. So throw back your lawn chair, put on your swim trunks, and get ready to chow on. Island style. 1. Heat sesame oil in a pan over medium heat. When hot, add ginger and bananas and saute for 5 -10 minutes to caramelize. 2. In a small bowl, mix bananas, ginger, and the rest of the ingedients together. Don’t be afraid, use your hands. 3. You can serve the salsa hot over fried or grilled fish, chicken, or pork or chilled as a topper for a fish taco.